Synchronize multiple devices with Plug2Sync and Backup. Sync PC with another PC. Plug2Sync and Backup provides an easy way of synchronizing files between desktop PCs by using a removable storage device. Whether you wish to sync files or Outlook data between your home PC and your office PC, or just keep files synchronized with your colleagues, friends or family, Plug2Sync and Backup does this fast, easy and safe. Sync PC with Laptop or sync Laptop with PC. Synchronization of data between desktop PCs and laptops is one of the most common uses for Plug2Sync and Backup. Most users own both a desktop PC as well as a laptop and transferring updated files between each computer and making the same changes manually to Microsoft Outlook more than once can be both time and energy consuming. Plug2Sync and Backup can keep your computers in sync automatically and it’s as simple as plugging in a USB device or SD card to your PC and laptop. Sync PC with Netbook or sync Netbook with PC. 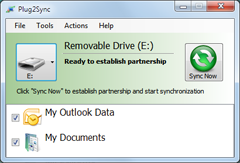 Plug2Sync and Backup can be used to synchronize documents, media files, bookmarks, Outlook folders or entire Windows folders between a desktop PC and a netbook. People who own a netbook often use it as a secondary computer and it is a common problem having to make frequent file transfers and manual changes in order to use the same data on both computers. Plug2Sync and Backup helps solve this problem effectively and offers a great deal of features to its users. Synchronize laptop with netbook and keep your files, folders and Outlook data updated on both computers. In case you travel often or if you switch often between using your laptop or your netbook, now Plug2Sync makes life easier for you. Use a USB memory device, SD card or other removable storage devices recognized by Windows and sync files and folders between your laptop and netbook easily. It’s just as easy to share or synchronize Outlook folders or entire Outlook .PST files. Plug2Sync and Backup is compatible with tablets running Windows 8 as well as with Microsoft Tablet PCs. Synchronize your Windows 8 tablet with your desktop PC, laptop or Netbook via USB and have the same data available to you anywhere you go. Sync documents, bookmarks, media files and entire Windows folders with your Win8 Tablet. Microsoft tablet PCs can be synchronized just as easily also. Microsoft Outlook emails, calendars, contacts, tasks, notes, journals and other Outlook folders can also be synchronized between your desktop PC, laptop or netbook and your Win8 Tablet or Tablet PC. Plug2Sync and Backup makes it simple to sync Outlook and Windows files and folders to help you stay mobile and have all your latest data available to you at anytime.